Size 3 - £20.99 Size 4 - £20.99 Size 5 - £24.99 Size 6 - £24.99 Size 7 - £23.99 Only 4 left! The jig is up. Your feet are a dead giveaway. You're no mermaid. At least, that's what people with be thinking if you waltz into the costume party wearing a pair of sneakers or plain black flats with your mermaid costume. Part of wearing a costume is about keeping up the illusion for as long as you can, but it's kind of hard to hide the fact that you're walking around on land with your feet. That's not something that most mermaids do! Of course, you can run a pretty great diversion by wearing these sparkling silver mermaid shoes for women. You might not be able to transform your legs into a mermaid fin, but you can at least create the illusion of being a mysterious sea creature by wearing these mermaid shoes. The shoes have a sparkly exterior and scale patterning to help make your feet look like a magnificent fin. 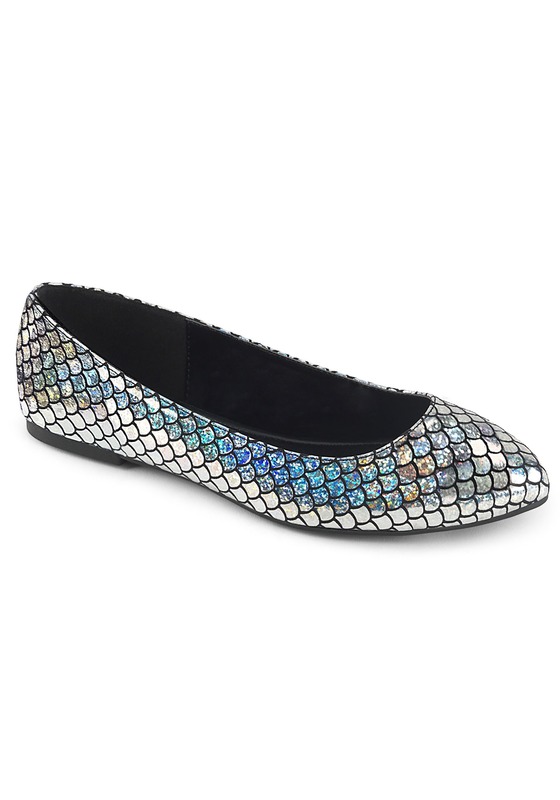 They're a classic flat style, so you don't have to wear tall heels with your mermaid costume. That can be especially convenient if you decide to wear one with a long, billowy skirt that mimics the look of a mermaid tail. Wear these shoes and people won't even notice that you don't have a tail! They're one of the easiest upgrades you can add to any mermaid costume!